6070 Rheinland, provisional designation 1991 XO1, is a paired Nysian asteroid from the inner regions of the asteroid belt, approximately 4.4 kilometers (2.7 miles) in diameter. It was discovered on 10 December 1991, by German astronomer Freimut Börngen at the Karl Schwarzschild Observatory in Tautenburg, Germany. The asteroid was named after the Rhineland, a region in western Germany. The stony asteroid has a rotation period of 4.27 hours. It orbits the Sun in the inner main-belt at a distance of 1.9–2.9 AU once every 3 years and 8 months (1,347 days; semi-major axis of 2.39 AU). Its orbit has an eccentricity of 0.21 and an inclination of 3° with respect to the ecliptic. The asteroid was first observed as 1950 TW1 at Heidelberg Observatory in October 1950. The body's observation arc begins with a precovery taken at the Palomar Observatory in March 1956, more than 35 years prior to its official discovery observation at Tautenburg. Several rotational lightcurves of Rheinland have been obtained from photometric observations since 2009. [a] Analysis of the best-rated lightcurve gave a rotation period of 4.27333 hours with a consolidated brightness amplitude between 0.40 and 0.58 magnitude (U=3). Published in 2014, a modeled lightcurve gave a period 4.273715 hours, as well as a two spin axes of (110.0°, −60.0°) and (290°, −60.0°) in ecliptic coordinates (λ, β). In 2017, modelling gave a period of 7004153853693200000♠4.2737137 h and a single spin axis of (124°, −87.0°), refining a previously published result of 7004153853560000000♠4.27371 h and (4°, −76.0°). According to a detailed study published in 2017, Rheinland measures 4.4 kilometers in diameter and its surface has an albedo of 0.20, while the Collaborative Asteroid Lightcurve Link also assumes an albedo of 0.20 and derives a similar diameter of 4.36 kilometers based on an absolute magnitude of 14.17. Rheinland forms an asteroid pair with asteroid (54827) 2001 NQ8, a newly found class of two unbound bodies on nearly identical orbits around the Sun. Asteroid pairs have not been studied in detail yet. In the past, the members of a pair (or cluster if more than two members) had very small relative velocities and may have been a binary asteroid until they became gravitationally unbound and continued on separate orbits. Other asteroid pairs may have resulted from a collisional breakup of a parent body similar to the process that formed the asteroid families. It is thought that this pair was created due to rotational fission (YORP effect) some 7004163400000000000♠16340±40 years ago. The other body of this pair, 2001 NQ8, has a diameter of approximately 2.09 kilometers, an albedo of 0.213, and is an assumed Q-type asteroid. This minor planet was named after the Rhineland, a region in western Germany. The official naming citation was published by the Minor Planet Center on 17 March 1995 (M.P.C. 24919). ^ a b c Pravec (2011) web: lightcurve plot (6070) Rheinland with a rotation period 7004153846000000000♠4.2735±0.0003 h hours and a brightness amplitude of 6999400000000000000♠0.40±0.02 mag. Quality Code is 3. Summary figures at LCDB and Pravec, P.; Wolf, M.; Sarounova, L. (2011). ^ a b Search for Unusual Spectroscopic Candidates Among 40313 minor planets from the 3rd Release of the Sloan Digital Sky Survey Moving Object Catalog (publication). SDSS-MFB (Masi Foglia Binzel) taxonomy (catalog). ^ a b c d e f "6070 Rheinland (1991 XO1)". Minor Planet Center. Retrieved 13 April 2018. ^ a b c d "JPL Small-Body Database Browser: 6070 Rheinland (1991 XO1)" (2018-02-25 last obs.). Jet Propulsion Laboratory. Retrieved 13 April 2018. ^ a b "Small Bodies Data Ferret". Nesvorny HCM Asteroid Families V3.0. Retrieved 13 April 2018. ^ a b c d e f g "LCDB Data for (6070) Rheinland". 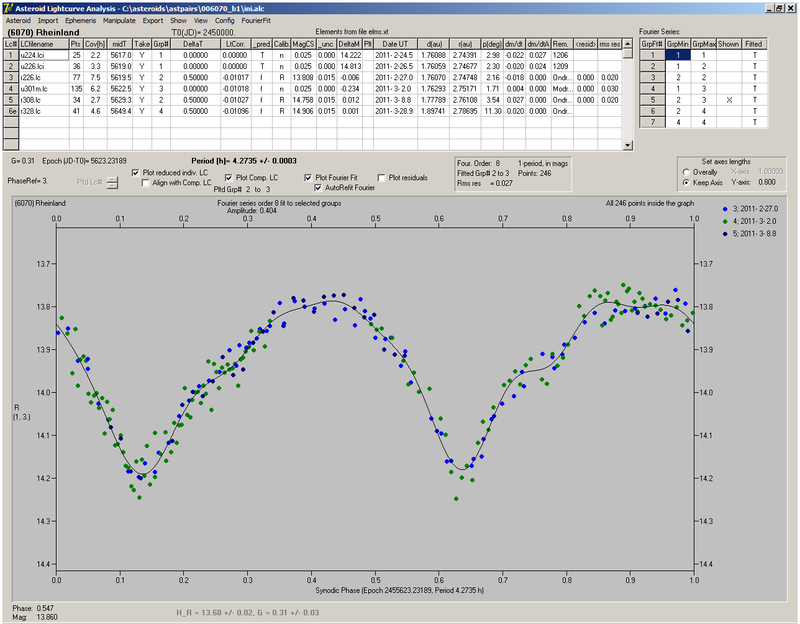 Asteroid Lightcurve Database (LCDB). Retrieved 13 April 2018. ^ a b c d e f g h Vokrouhlický, David; Pravec, Petr; Durech, Josef; Hornoch, Kamil; Kusnirák, Peter; Galád, Adrián; et al. (June 2017). "Detailed Analysis of the Asteroid Pair (6070) Rheinland and (54827) 2001 NQ8" (PDF). The Astronomical Journal. 153 (6): 17. Bibcode:2017AJ....153..270V. doi:10.3847/1538-3881/aa72ea. Retrieved 13 April 2018. ^ a b Pravec, P.; Vokrouhlický, D.; Polishook, D.; Scheeres, D. J.; Harris, A. W.; Galád, A.; et al. (August 2010). "Formation of asteroid pairs by rotational fission". Nature. 466 (7310): 1085–1088. arXiv:1009.2770. Bibcode:2010Natur.466.1085P. doi:10.1038/nature09315. Retrieved 13 April 2018. ^ a b c Vokrouhlický, David; Durech, Josef; Polishook, David; Krugly, Yurij N.; Gaftonyuk, Ninel N.; Burkhonov, Otabek A.; et al. (November 2011). "Spin Vector and Shape of (6070) Rheinland and Their Implications" (PDF). The Astronomical Journal. 142 (5): 8. arXiv:1111.2061. Bibcode:2011AJ....142..159V. doi:10.1088/0004-6256/142/5/159. Retrieved 13 April 2018. ^ a b Polishook, D. (October 2014). "Spin axes and shape models of asteroid pairs: Fingerprints of YORP and a path to the density of rubble piles" (PDF). Icarus. 241: 79–96. arXiv:1406.3359. Bibcode:2014Icar..241...79P. doi:10.1016/j.icarus.2014.06.018. Retrieved 13 April 2018. ^ a b c Waszczak, Adam; Chang, Chan-Kao; Ofek, Eran O.; Laher, Russ; Masci, Frank; Levitan, David; et al. (September 2015). "Asteroid Light Curves from the Palomar Transient Factory Survey: Rotation Periods and Phase Functions from Sparse Photometry" (PDF). The Astronomical Journal. 150 (3): 35. arXiv:1504.04041. Bibcode:2015AJ....150...75W. doi:10.1088/0004-6256/150/3/75. Retrieved 13 April 2018. ^ a b Behrend, Raoul. "Asteroids and comets rotation curves – (6070) Rheinland". Geneva Observatory. Retrieved 13 April 2018. ^ a b c Veres, Peter; Jedicke, Robert; Fitzsimmons, Alan; Denneau, Larry; Granvik, Mikael; Bolin, Bryce; et al. (November 2015). "Absolute magnitudes and slope parameters for 250,000 asteroids observed by Pan-STARRS PS1 - Preliminary results" (PDF). Icarus. 261: 34–47. arXiv:1506.00762. Bibcode:2015Icar..261...34V. doi:10.1016/j.icarus.2015.08.007. Retrieved 13 April 2018. ^ Pravec, Petr; Harris, Alan W.; Kusnirák, Peter; Galád, Adrián; Hornoch, Kamil (September 2012). "Absolute magnitudes of asteroids and a revision of asteroid albedo estimates from WISE thermal observations". Icarus. 221 (1): 365–387. Bibcode:2012Icar..221..365P. doi:10.1016/j.icarus.2012.07.026. Retrieved 13 April 2018. ^ Nesvorný, D.; Broz, M.; Carruba, V. (December 2014). "Identification and Dynamical Properties of Asteroid Families" (PDF). Asteroids IV: 297–321. arXiv:1502.01628. Bibcode:2015aste.book..297N. doi:10.2458/azu_uapress_9780816532131-ch016. Retrieved 13 April 2018. ^ a b Johnston, Wm. Robert (14 October 2017). "Asteroid pairs and clusters". Johnston's Archive. Retrieved 9 December 2017. ^ Vokrouhlický, David; Nesvorný, David (January 2009). "The Common Roots of Asteroids (6070) Rheinland and (54827) 2001 NQ8". The Astronomical Journal. 137 (1): 111–117. Bibcode:2009AJ....137..111V. doi:10.1088/0004-6256/137/1/111. Retrieved 13 April 2018. ^ "MPC/MPO/MPS Archive". Minor Planet Center. Retrieved 13 April 2018. This page was last edited on 6 January 2019, at 13:22 (UTC).